The Stonebound Saga started the story, and now Sky Kingdom Games is proud to announce the next chapter in the series titled 'Visions of Telios'! Stonebound from all over Telios have come together to create the newly formed Kingdom of Lux. With Tenebris looming, the Stonebound have been training with their newfound powers fueled by the Speaking Stones. Through dedication and practice, some of the Stonebound have achieved a new depth of mastery - the ability to harness the power of Telios itself. The first expansion for 'The Stonebound Saga'; Visions of Telios introduces two brand new card types called 'Terrain Cards', and ‘Mission Cards’. Terrain cards represent various locations from the world of Telios that are used to modify spaces on the battlefield during gameplay. These modifications can be beneficial or detrimental, and they affect allies and enemies equally. Terrain cards open up a completely new gameplay experience by adding another exciting level of strategy. Mission Cards are special objectives given to the Stonebound to further their training and preparation against Tenebris. Players will use Mission Cards to grant themselves and the Stonebound they command powerful rewards that can turn the tide in battle. Mission cards add new and exciting ways to win against your opponents in battle. Let's take a deeper look at each new card type to discover what new aspects they bring to The Stonebound Saga. The first new card type being added is Terrain Cards. Terrain Cards were originally going to be the final stretch goal for our Kickstarter campaign last Summer. Now looking back, it was a blessing to wait and refine this new aspect of the game. While working on production of The Stonebound Saga our team was able to continue developing the world of Telios and the lore behind the various characters and places that made up this world. We also took a longer look at how each terrain location would effect the gameplay and add different elements of strategy. Terrain cards greatly change the gameplay in The Stonebound Saga by making our large size gameboard more dynamic and forcing players to think even harder about unit positioning. No longer will battles end up static in a smaller area of the gameboard after a few rounds. Players will need to maneuver their characters around obstacles and navigate through changing weather conditions. Terrain cards open up a myriad of new character team choices and add new mechanics between players! In addition to the character cards players will pick for their teams; players will now choose or draft a total of 10 stars of rarity from the 'Terrain Card' deck. Each player may not have more than 3 of the same terrain card in their deck. Each Terrain Card comes with a corresponding 'Scroll Card' that states how the Terrain Card works in battle. These Scroll Cards are kept in front of each player for reference. Players will be able to activate terrain cards in battle by using 'Speaking Stone' cards just like they do to use their character's abilities. It is wise to pick terrain cards based off elements that are not in use by their characters to ensure they will not have any unused resources each turn. Once a terrain card is activated the speaking stone cards are discarded. When a terrain card is played it can be placed on ANY OPEN space on the battlefield. (not occupied by a character or another terrain card) However, there are some exceptions to this rule if indicated by the Terrain Card. Once a terrain card is placed on the battlefield it can be used by ANY player. This means both positive and negative effects are in play for both players. Terrain cards bring about attributes from various places and effect the battle in many ways. Each card is an actual location from the world of Telios. Now, let's look at a few of the Terrain Cards and how they work in battle. We will be covering each card in more depth at a later date. There are several terrain Cards you can use to modify areas of the battlefield which will force your opponents to adjust their strategy and how they position their characters. These locations can add various status effects, and modify character stats. Other Terrain Cards will introduce completely new ways of playing. This includes trading resources with ally players, trading stars of terrain for stars on your character team which opens up brand new team compositions, and even swapping the damage type of character classes! There's an incredible amount of combinations to discover! Other Terrain Cards provide increased negation and evasion chances, some may manipulate dice rolls, and some may even effect the power of the Speaking Stones themselves! The second card type being added with Visions of Telios is 'Mission Cards'. Visions of Telios will include 35 unique Mission Cards that players will attempt to complete throughout the game. At the beginning of the game each player will draw 5 cards from the 'Mission Deck' that will act as a community deck just like the Speaking Stone deck. Then the player will choose to keep 3 of the Mission Cards and discard 2 of them. Many Missions will be easy to complete as the characters may have abilities that can complete the given objectives. Others may be more difficult and may require the combination of Terrain Cards! 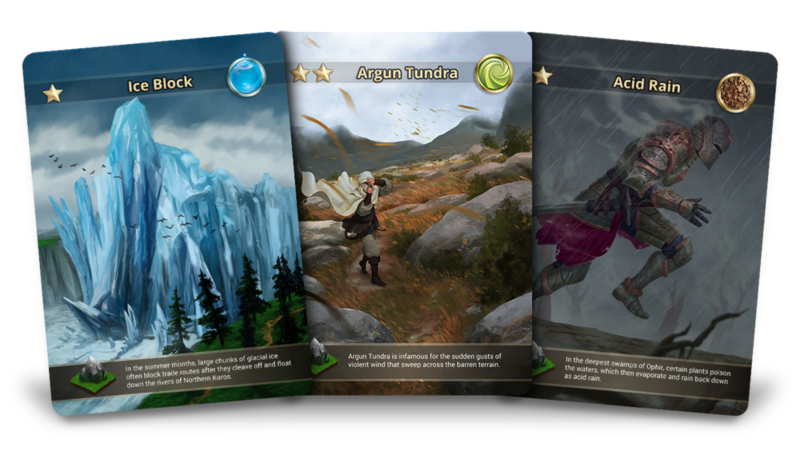 Terrain Cards and Mission Cards will add many new ways to play The Stonebound Saga.